While National Geographic’s cameras rolled, Tim Ralston showed off his arsenal of survival weapons in the Arizona desert. As he demonstrated shooting one of his rifles, he carelessly slipped his thumb in front of the barrel and pulled the trigger resulting in a devastating wound and necessitating his evacuation by helicopter to a trauma center. Mr. Ralston is a star of the new reality TV series on National Geographic called “Doomsday Preppers”–a show dedicated to the profound paranoia, hysteria, and insolence of folks convinced that the end of the world and society is near. From the couple who doesn’t drink but insists on stockpiling whiskey, rum, and vodka (for trading and bartering after the currency collapses) to the New York City firefighter fearful of the Yellowstone super-volcano and the potential for knife fights after society collapses, all the individuals and families featured on the show display the worst traits of disaster preparedness. While citizens, the private sector, and jurisdictions at all levels are embracing the Whole Community approach in order to minimize damages and increase community resiliency in the face of any disaster, the folks featured on Doomsday Preppers seem to have dismissed the notion entirely that community resiliency is a worthy goal. 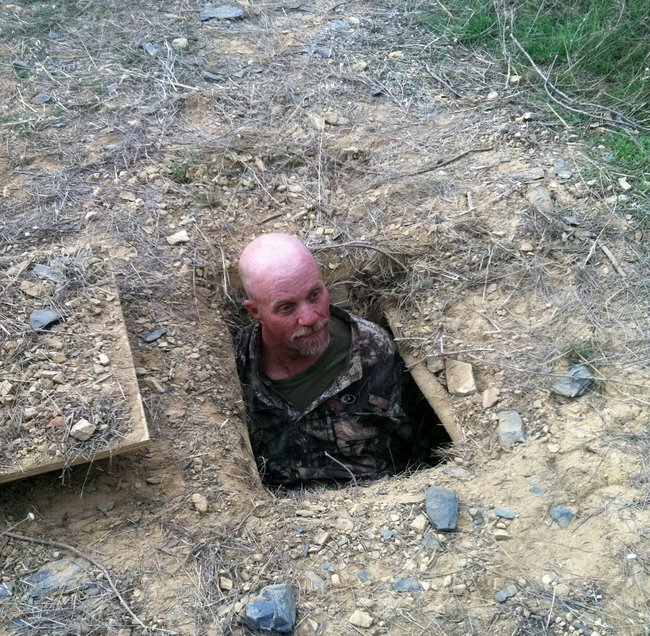 Instead, the doomsday preppers focus their efforts on devising methods to isolate themselves from the world. Not only do they come across as paranoid misanthropes, the doomsday preppers are uniquely anti-social. As the firefighter in New York City explains, it’s difficult for him to lawfully own firearms in the city, so he’s settled for maintaining an extensive knife collection and paying for private tutoring sessions from edged weapons instructors. His goal is to learn how to use his knives to stab intruders who would threaten his 90-day storage of food. Besides the knives, the firefighter also keeps a box of broken glass by the door to his apartment (that he shares with his wife and two young children) that he plans to scatter in the hallway in an emergency–both to serve as a warning for and impediment to intruders. 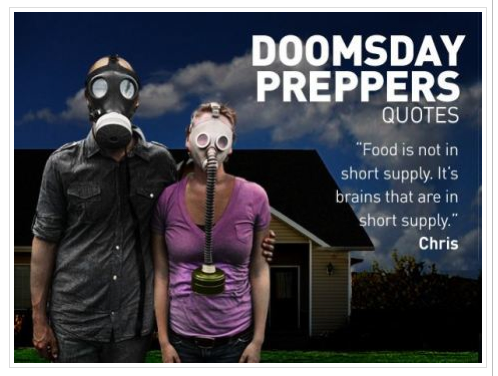 For me, the philosophy behind these doomsday preppers is misguided. While individual preparedness is crucial, the doomsday preppers are not simply preparing as a member of the community, but as exclusions of the community. They conscientiously reject pre-disaster societal norms and substitute it with their anticipated version of post-disaster utopia: a society framed on stand-your-ground and shoot-first vigilantism and fanaticism, which is inherently dangerous. Rather than investing so much budget and effort into weaponry, I’d much rather see the folks featured on Doomsday Preppers become leaders in their community, working with the elderly and those with access and functional needs to prepare resilient plans during a disaster. While the series shows knife-fighting scenes and rifle practice, I came away asking myself “where was the CPR and AED training?” and “why isn’t Community Emergency Response Team (CERT) training mentioned?”. Political fanaticism masquerading as disaster preparedness challenges legitimate forms of community resiliency and disaster preparedness. Planning and preparing for disasters as a community is a patriotic duty. Ensuring that a post-disaster America continues to be the land of freedom with an enduring form of constitutional government in the face of all types of disasters is patriotic too. Unfortunately there’s no television show for the emergency managers, public servants, volunteers, community organizers, public health planners, and countless others that work thanklessly to help our communities strengthen in resiliency, planning, readiness, and preparedness. In the end, it’s not the isolated and paranoid survivalists that define disaster preparedness, but those dedicated to strengthening our communities, helping the frail, supporting the sick and injured, and fostering a climate of resiliency and helpful coordination that are the role models for future generations of preppers. While the isolationists literally prepare their holes in the ground and shoot their hands off in the hopes of outmaneuvering the rest of humanity, those of us who answer the selfless call of duty for preserving and improving our communities will continue our efforts to organize and strengthen in productive and positive ways.